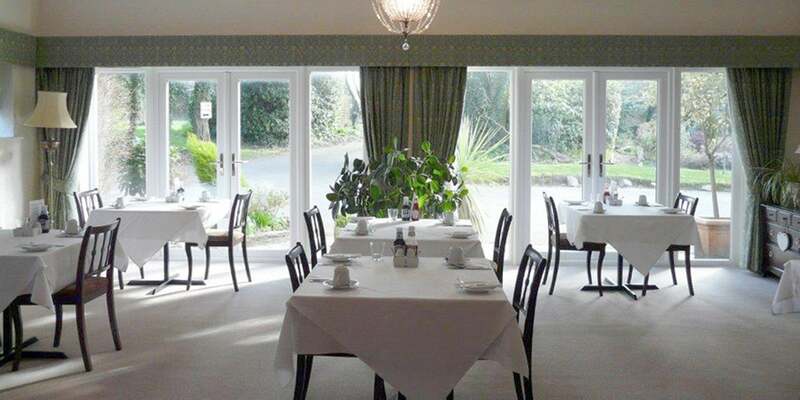 Breakfast and evening meals are served in our dining room, which is also available for functions and lunch events. Your breakfast (pdf) will be cooked to order, so during busy periods there may be a small wait. We source as much as we can from local suppliers. Our eggs are free-range from Cindy Rice at Higher Tredis Farm in Torpoint and our delicious Cornish sausages and back bacon are from Paul Bray & Son, a small family butchers in Tideford. Breakfast is served 8-9am on weekdays and 8.30-9.30am on the weekend and bank holidays. If you have any dietary requirements please let us know prior to your arrival. Our dining room is now open for dinner 5 nights a week on Monday, Wednesday, Thursday, Saturday and Sunday from 1st April until 30th September. We are closed for dinner on Tuesday and Friday. Our Dinner Menu (pdf) is only available on a pre-ordered basis. Please order any arrival day choices at least 48 hrs before you arrive. Within the guest lounge is our quirky Guest Bar offering a good selection of local beers, spirits and soft drinks at a reasonable price. We also have a great wine list supplied by Castang Wines in Looe. If you have a special anniversary or birthday coming up or would perhaps like to celebrate a christening or business success, why not celebrate with close friends and family at Pencubitt House. Our dining room and charming guest lounge are available for small private functions such as an intimate dinner party and afternoon teas. Call us to discuss your needs; we would be pleased to help with ideas and suggestions.